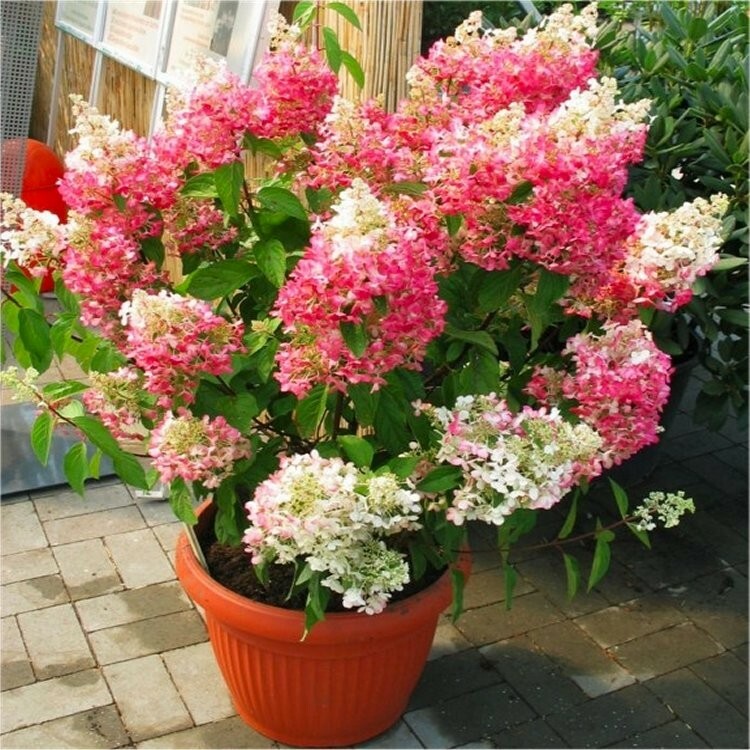 An exciting hardy hydrangea developed in Belgium, and is an absolute must-have for your garden. Unique in form, with two-toned flower heads in mid-summer, it provides colour and garden interest over a long period, and is very easy to grow and care for too. 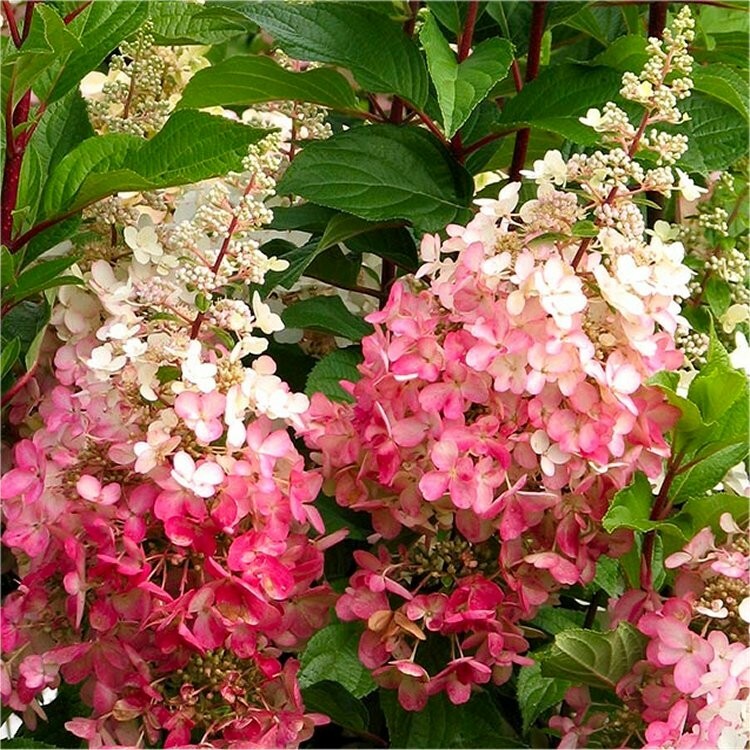 Large, 12-16 inches long flower heads emerge white-cream, turning to pink and then finally continue deep burgundy, all the while Diamond Rouge will continue to push new white flowers from the tip of the panicle. The two-toned effect is absolutely stunning! Hydrangea paniculata Diamond Rouge flowers are held upright on strong stems and contrast nicely against the dark green foliage. It blooms regardless of climate, soil, pH or pruning, in fact even if you cut to near soil level in spring, it will regrow to around a metre tall and bloom again the same year - it is a truly remarkable plant for the summer and autumn landscape. Another idea with these large flower heads is to cut stems to use indoors in floral arrangements, the creamy blooms aging through shades of pink to deep rose will lend themselves to many situations, always looking absolutely fantastic! 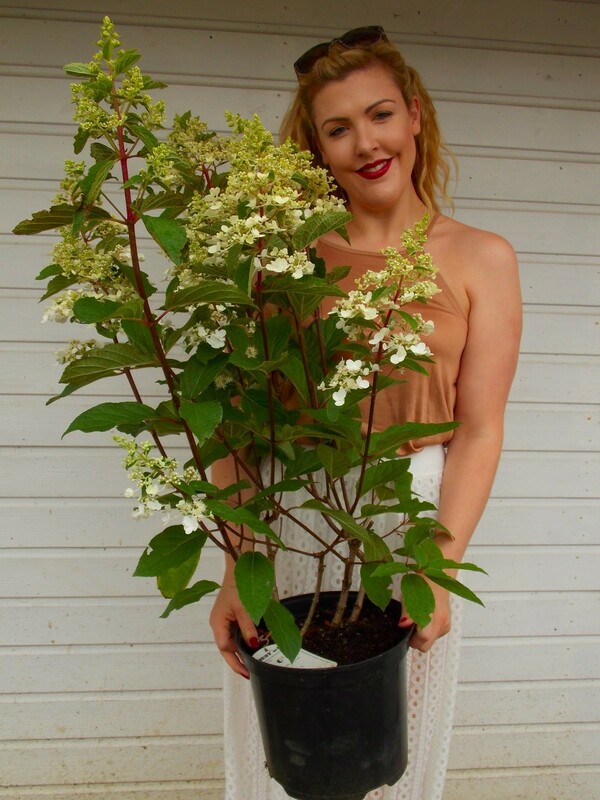 This Hydrangea will reach up to 1.5m tall with a spread of around 1m if left un-pruned. Our large plants are supplied in approx 7.5-10 Litre containers, and are very strong specimens, they'll look superb in season, covered in buds and blooms. Plants are tough robust and fully hardy, grown out of doors on our Essex nursery all year round. Check the Quality in the images - Charlotte is pictured with actual stock as supplied in season, photo taken 28th July. In the Winter months and other times of year please be aware plants may be hard pruned in line with good horticultural practice to promote bigger bushier plants.